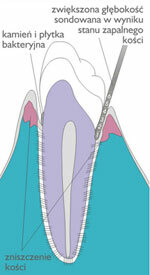 Paradontosis – this is a parodontium (tissues that surround the teeth) disease. It is a multi-causal condition whose occurrence, intensity or duration is influenced by a variety of factors. The main cause, producing pardontium conditions is improper oral hygiene. The growth of parodontosis is also affected by general health: a faster spread can be noticed in persons with a lowered immunity, hematopoietic system diseases, intestinal irritation, nervous system problems, hormonal imbalances or skin diseases. The next important cause is genetics – in case of predisposed people the probability of the disease increases . However, with good hygiene and regular dental care, the disease does not have to occur. For persons especially susceptible to parodontium diseases and also in order to hold up the effects of treatment we have created a special program of prophylaxis/hygiene. Gum inflammation is a disease that most commonly precedes the development of paradontosis. It is caused by a bacterial infection, which initiates the inflammation process. Contained in unremoved plaque, the microorganisms attack healthy gums. During the first stage of the disease, the gums look normal or slightly red, they can also be sensitive, causing pain or bleeding. 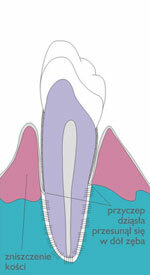 Changes can occur in the area of one to several teeth, or they can include entire tooth arches. Untreated inflammation can lead to irreversible changes in the oral cavity. Further, not stopped in time, development of gum inflammation damages parodontium fibers, which hold the gum tightly around a tooth. This causes the plaque to penetrate deeper into the gum fissure and furthers disease development. Pathological pockets are produced, which lead to bone atrophy, followed by the exposure of the root surfaces. Teeth become sensitive, which can cause pain, and uncovered roots are exposed to bacterial decay processes. It also leads to unpleasant esthetic changes. As a result, intensified advanced symptoms, mainly progressive bone atrophy, lead to making the tooth mobile and with time tooth loss. This development can be prevented if the disease is detected and treated early enough, and if the general oral hygiene is improved. The most important factor in the prevention of paradontosis is proper oral hygiene, which consists in proper brushing, flossing, use of water irrigators, special brushes cleaning the interdental space, dentist check-ups (every 6 months or more often), as well as regular scaling (removal of plaque). tel. : 00 48 12 412 32 03 Chętnie odpowiemy na Twoje pytania.